A good curry is to boiled rice, what a lead guitar is to a rock band. One cannot exist without the other. And without a good curry, boiled rice is just that. Bland and boring. Which is why a good meat curry is always a good thing to have in your arsenal. I’m not the biggest fan of pork by the way. Bacon? A thousand times yes! Pork? Not as much. It would have to be cooked a certain way for me to even want to try it. For example, pork roast – if cooked properly with lots of flavour, yes but not much. Twice cooked crispy pork belly – yes but no leftovers please (unless the belly is made crisp again). 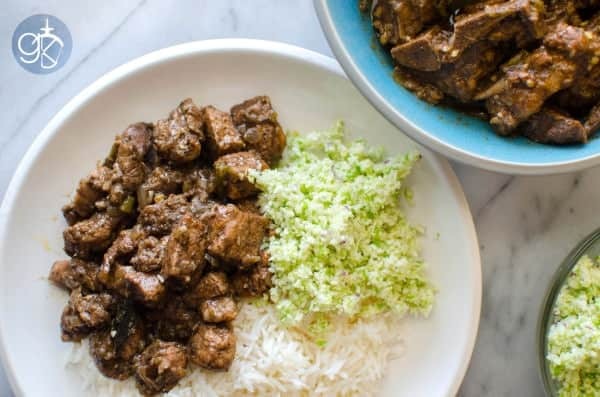 Devilled pork (a very Sri Lankan dish) – yes to leftovers too. Having said that, my absolute favourite way to eat pork is this dish right here. Spicy Sri Lankan Black Pork Curry! With big and bold flavours, this tastes phenomenal! Coming from someone who doesn’t like pork much, that means something! The name “black pork” comes from the colour of the final product, as you may have guessed. And that colour comes from the dark roasted curry powder that’s used to prepare this dish which is mixed with tamarind paste and black pepper. I did add some cayenne pepper purely for Mr K’s benefit, because his threshold for heat is the same as that of a fire breathing dragon. But feel free to leave out the cayenne pepper for less heat. As for the photos of the black pork in this post, I’m really not sure they do this dish any justice. There are some foods/dishes where photos just don’t convey how incredibly flavourful they are, no matter how much you twist and turn your body to get that perfect shot or perfect angle. This was one of them. So just take my word for it. If you like a good meat curry, this will be a staple in your house. Tamarind is a crucial addition to this recipe. I have made a variation of this curry using lemon juice instead, and while it’s still delicious, it’s just not the same thing. You should easily be able to find tamarind paste in your local Asian/Indian grocery store and even on Amazon. Tamarind and another type of “fruit” called goraka are regularly used in Asian cooking. They both add distinct sour notes to curries and even a hint of sweet/fruity taste too. Tamarind is more popular as it’s used in numerous dishes and there are a few different types of tamarind too. There’s one type called velvet tamarind, which I particularly like and is delicious. It’s something I used to snack on quite a lot when I was little, and I remember collecting the shell of this fruit because they had a really fun velvety skin (hence the name), and for a time I thought they used those shells to make velvet. True story. And the best part about this spice mix is that you can use it for any type of meat curry – chicken, beef, lamb, whatever. You can get Sri Lankan roasted curry powder from Sri Lankan or Indian Specialty stores, or make it yourself with my easy Sri Lankan roasted curry powder recipe. A fantastic curry with big, bold flavours! A Sri Lankan classic, this is made with Sri Lankan Roasted Curry Powder and Tamarind. Cut the pork into ½ - 1 inch cubes. If the pork chops have bones you can add those to the curry as well, as they add more flavour. Crush the cardamom pod seeds into a powder and mix it with the black pepper, curry powder, salt, cinnamon, cayenne pepper. Next, crush and mix all of this together using a mortar and pestle. The next day, bring the meat to room temperature before cooking. Heat 2 tbsp of oil in a saucepan over medium heat. When the oil is hot, add the bay leaves and ginger and onions, and saute till the onions become translucent. Add the garlic and sliced jalapeno peppers and saute for another 30 seconds. Add the marinated pork and sugar and stir to mix well. Add about ½ cup of water and bring this to a boil. Lower the heat to medium-low and let it simmer for 1 hour. Check on the curry, and add extra water if it dries out. Taste and add more salt and some lemon juice - only if needed. You can serve this curry immediately, but it tastes better after it has rested for a little while. Even better the next day! The reason why I love this curry so much, is the balance of flavours. If you’d like to increase that beautiful peppery heat (and the colour), just add a little more black pepper. The addition of tamarind paste give this curry a delicious sour note that complements the heat really well. And since it’s a meat curry, you can pair it with a number of side dishes like salads, vegetable curries, lentil curry etc. Our favourite way to eat this however is with a side of coconut sambol (a traditional Sri Lankan dish) or green pepper coconut sambol (pictured below). This is a curry we love eating no matter what protein we choose to make it with. Pork seems to work best though, because of the texture and the flavour of the meat. And it’s one of Mr K’s ultimate comfort foods. If you liked this recipe don’t forget to subscribe for new (and free) recipes and updates by entering your email address below (and get all these recipes delivered straight to your inbox), so you don’t miss out on a thing. Loved your recipe. Sorry I don’t have pics to share this time. I made the roasted curry powder first. Turned out it makes all curries and vegetable dishes taste amazing. The pork turned out just like yours looked in the pics tho a little too sweet for our taste buds. Next time I’ll add just a pinch of sugar and definitely click some pics and share. Thanks a lot for sharing such an amazing recipe. Goodness me… brilliant. Have just had this dish. With some Moong & Red Lentil dal, plain boiled rice and an onion, cucumber and tomato raita. My wife and I both agreed that’s it’s one of the best internet recipes we have ever cooked. Probably the best. Thanks you very much for your fast responses to my questions. A great help. Thank you so much for letting me know how it turned out Roy! I’m so glad that you and your wife enjoyed the recipe. And that looks like a fantastic spread. 🙂 Reminds of some of the meals I used to have growing up in Sri Lanka too! Tamarind paste vs Tamarind Concentrate… there seems to be some confusion on the web about this. Some people say it’s the same – others say differently. In this recipe I have used 3 teaspoons of Concentrate…. Marinating now – hoping this is going to be OK and not too overpowering. Should the black peppers also be crushed or left whole? I crush the cardamom seeds first, then add this powder to the rest of the spices and crush it all together with a mortar and pestle. I just prefer the cardamom seeds to be finely ground, but prefer the black pepper to not be too finely crushed/ground, so that’s why the cardamom seeds get crushed first. Hope that helps! Thank you so much for the quick response – very impressive! Just in time – the pork and other ingredients are ready to go! I waited overnight for your response (i’m in the UK) and hey presto! They will marinate all today. 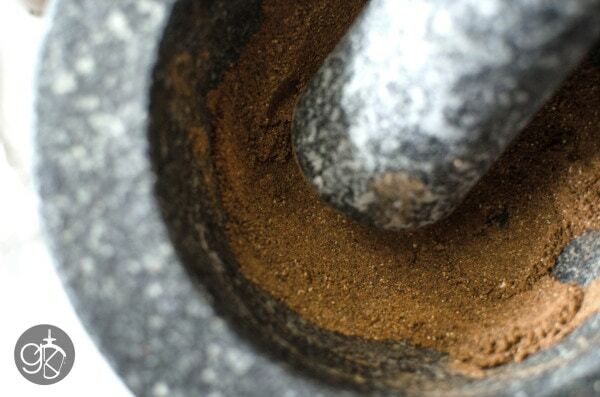 2 Crush the cardamom pod seeds into a powder in mortar & pestle. 3 Crush black pepper coarsely. 4 Mix the cardamom powder, crushed black pepper, curry powder, salt, cinnamon, cayenne pepper. It’s now marinating in the fridge… looks and smells really good. Can you tell me why I make s o much powder mix and only put in 2 tablespoons for a marinade? Am I supposed to add the rest at some point? The 4 tsp whole black pepper, cardamom seeds, cinnamon, cayenne pepper + 1 tsp Sri Lankan curry powder should give you roughly 2 tbsp (maybe a little extra) of the spice mix for the marinade. But if you do end up with excess, you can save the dry spice mix for another curry, in an air tight container. Sometimes, my readers have added a little extra while cooking the curry, if they want it spicier. I absolutely loved eating crab curry while growing up too (still one of my favorite curries!). I hope you enjoy this curry too! It would taste amazing with goat meat (we have tried it with Lamb and love it!). Let me know how it comes out. Oh yum yum yum!!! My husband and I loved this curry. The pork was melt in the mouth good. Beautiful authentic flavours. This one will be a regular for us thank you!! The roasted curry powder link takes me to green apple curry. Am I high or what ? Haha, thanks for letting me know Nilan. I have fixed the link now and it takes you to my roasted curry powder recipe. My husband requested curry for his birthday dinner – and your recipe enabled him to have a fantastic super yummy celebratory meal! Made it with our home raised pork. I’ve got a ton of the spice blend left from making your linked recipe – looking forward to trying it on chicken or beef next. Thank you! Thank you so much for letting me know Cathy! This makes me so happy!! 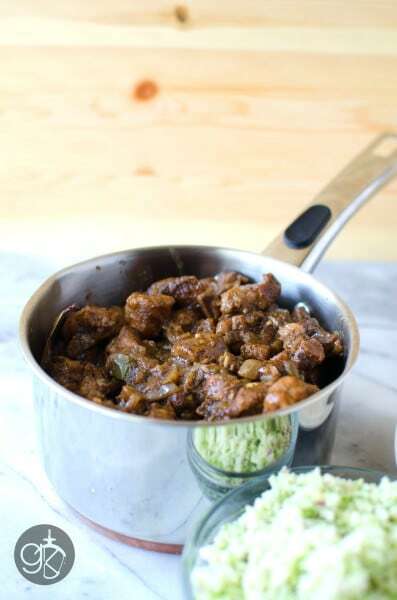 This pork curry is one of our favorites ever and making it with home raised pork would have made it even better. I hope you try some of the other curries on the blog that use the same spice mix. A chicken curry will be appearing on the blog very soon too! 😀 Happy belated Birthday to your husband too! Excellent recipe. And this was an excellent comeback from my first disastrous try of the Sri Lankan Pork Black Curry. My husband hardly touched that, this he loved and said to save the rest for him!! LOL! Planning to try out this recipe tomorrow but saw it should be kept marinated overnight. is it a must?? Hubby is a crazy fan of pork. Hope it would come out well. PS. Have u posted the recipe of the pork curry using roasted rice and grated coconut?? I am so sorry for the late reply. Marinating isn’t necessary but it does make the meat more flavorful. At least 1 hour of marination is better than not marinating it. If you do have the tamaraind with seeds, you can soak 1-2 inch piece in some hot water, and let it soften and use the softened tamarind (seed removed) instead. It’s hard to give quantities, but I would suggest to add a little at a time till you have the desired taste. Hey Dini, new to your site, it looks as fascinating as I’d hoped, as it’s appealed to the wanderer in me! I will absolutely try this black pork curry with black pork!! Did you already post a recipe for the green pepper coconut sambol? I’m looking forward to more tasty suggestions from you. Thank you so much! 🙂 I haven’t shared the recipe for the green sambol, but will try to create it and share it on the blog in the next month or so! I am definitely surprised to hear about a black pig bread for meat too! 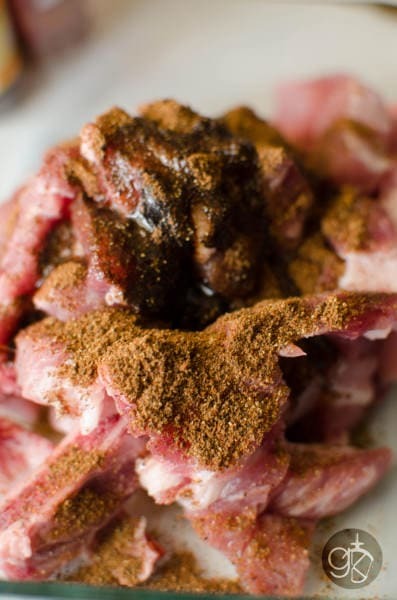 It will definitely be interesting to have black pork curry made with black pork! 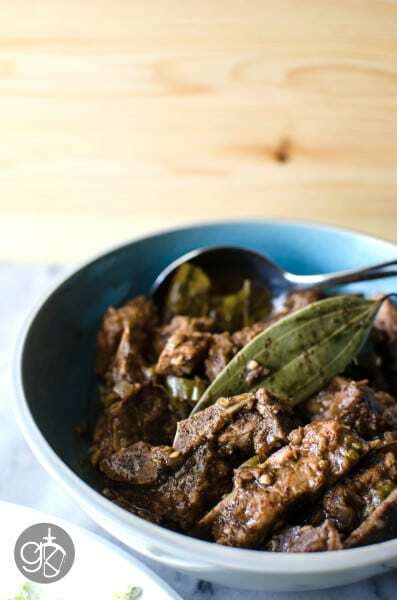 Although if it tastes like wild boar, then it will taste delicious as Sri Lankans cook with wild boar and this is their favorite preparation for Wild boar! 🙂 I hope you let me know how it turned out! Thanks so much for this recipe. 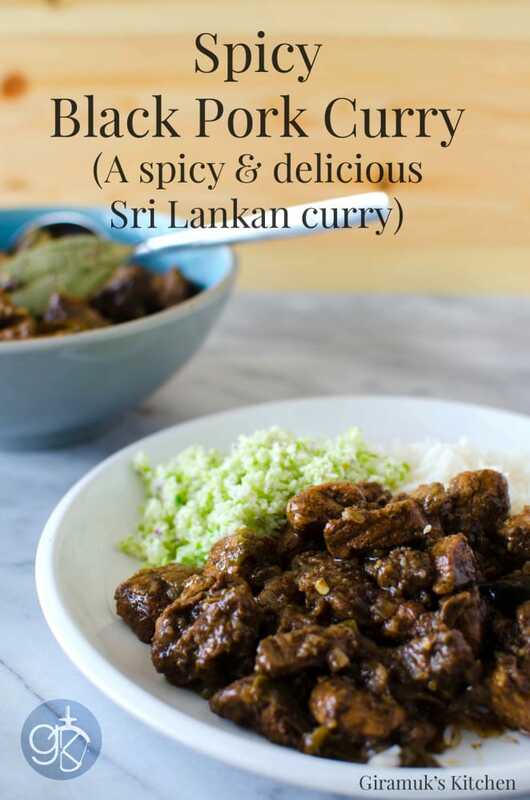 I love trying recipes from around the world, and this was my first from Sri Lanka 🙂 Made this for dinner tonight and it was party-in-your-mouth good! Juicy pork with that wonderful tart-spicy sauce. Also made your toasted curry powder. LOVED the smell of the toasting spices and can’t wait to find more dishes to make using it. Thanks again for this intro to the food of Sri Lanka. And if anyone is wondering, this works really well in the pressure cooker, too. I added a little more water, about 3/4C total, and cooked for 45 minutes on high. hi, first time i have been on this site it looks very good, well done. i cook a lot of indian curries but i do love sri lankan food, wonderful. i will make this today i hope depending on when you reply, the question is: green or black cardamon seeds ?????????????????? so will let you know how it went asap. I made this after a quest of a week doing research (I’m new to cooking South Asian food myself), getting the ingredients together and planning a day to make the roast curry powder and then a day to make the actual curry. It was quite the voyage of discovery although I may not have roasted the curry powder ingredients as I was afraid of burning them, still it turned out nice and spicy. Next time I think I’ll up the cayenne pepper as well as use more jalapeños or actually bother to find some scotch bonnet chilies. All this because I had some leftover pork in the fridge one week but I ended up making an awesome dinner the next, it’s funny the where some stuff takes you. I’d post some pictures of my endeavour but it appears you cant in this comment section alas. Hi Dini I tried this receipe today and it tasted awesome . Easy to make and very tasty , full of flavour . My family loved it . This is gonna be a keeper . Thanks very much for sharing . Best regards .Shyamalie . Dini your pork recipes are going to be winners! How do you get such good colour on them. They look really mouth watering! Of course I’ll be making this one and the pork chops with peaches. I thought that was a great thing to marry those two ingredients. Thanks for all the great ideas you keep giving us. Thank you so much Zita!! 🙂 This is one of our absolute favourite ways to eat Pork! The colour is from the roasted curry powder, and black pepper. I hope you do try them both and let me know what you think of them 🙂 Hoping to work on more pork recipes in the near future too! I was in Sri Lanka last summer and feared I could never replicate the black pork curry I had there. Then I found this recipe! It’s easy and absolutely delicious! Thank you so much! By the way, I have to make a triple batch now. My family loves it and it disappears! What an amazing recipe ! True in its quantities , so predictably comes right every time . I’ve recommended it to many -would also like to enquire whether you have a recipe for chicken curry ? Thank you so much for that wonderful comment Darshi! 🙂 I’m so glad you liked it! I do have a great, go-to recipe for Sri Lankan Chicken Curry, although it’s not on the blog yet. BUT, I’ve been thinking about posting it, and now that you mentioned it, I’m going to do it soon! 🙂 I will let you know when I do. Lovely recipe, not mention of when the jalapeño should go in though….I assume you put them in after the opinions?. Hi Henry! Thank you so much for pointing that out 🙂 Yes, you do add the Jalapeno after the onions, along with the garlic. But you can add the Jalapeno with the onions too. The simmering will ensure that the jalapeno flavour infuses into the curry well. I have fixed the recipe to reflect this too. 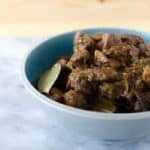 I have been looking for a good Black Pork Curry recipe for some time. Will definitely try this. Is the amount of curry powder enough for this quantity of pork I wonder. This recipe has been toned down slightly for those who may not have curry all the time! I made the black pork curry last weekend as per your recipe. It was out of this world. This is what my youngest daughter wrote to her sister in DC. ” Aiyo, couldn’t take a pic of our lunch. It was soooo gooood. The black pork curry was amazing. Ammi really outdid herself” Thank you for the recipe. I love curry! 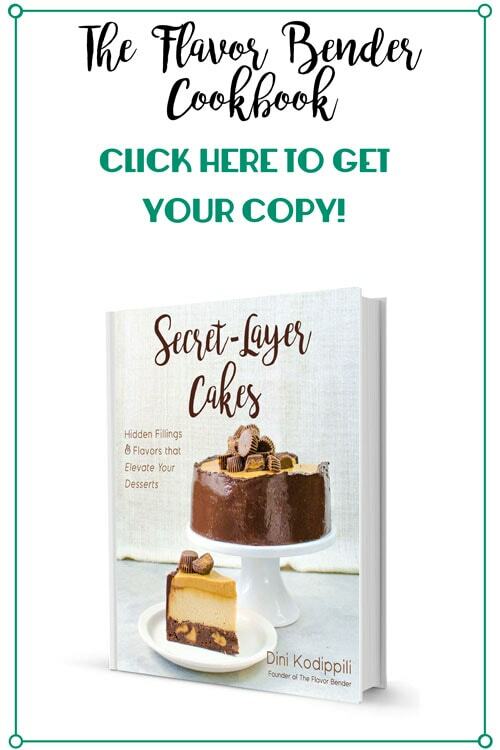 I need to try this…I just love your recipes, Dini! I love pork, so I would definitely love this dish! It looks amazing! Wow – what an amazing dish! I have not had much Sri Lankan food because I am a wimp when it comes to spices, but this looks just too good to be missed! Thanks for sharing! Really enjoyed your recipe. We made it with Goat Meat and kept it overnight as suggested by you. And wow!! the flavours were out of this world. We enjoyed the meat, rice and the coconut sambal combined with unsweetened yoghurt and that seem to enhance the overall flavour/taste of the meal. We do like a bit of yoghurt/onion/green chilli mix with my rice anyway and this mix seem to blend very well. Thank you very much. Next time I will definitely be trying it with a side of savoury yoghurt! Thank you Amanda! 😀 You get my struggle right? hahaha!! This looks so delicious Dini! I’ve pinned it! This looks amazing! Not only are your pictures expertly taken, but the subject matter is quite stunning as well. As soon as I get my hands on some tamarind paste, I’m going to have to give this a try. This dish looks delicious as usual, thank you for bringing it to the Fiesta!